Patti knew that she wanted to eventually buy something for herself and was diligently saving money each month in anticipation. 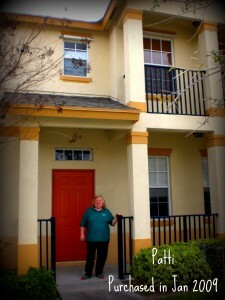 After renting for two years, a good deal fell in her lap sooner than she had expected! Nestled in the community of East Lake Village, a foreclosure had just hit the market. I had gotten the lead from the listing agent without originally intending to show the property. As the sun was setting, we ended up touring this new listing at the very last minute and falling in love. The carpets were clean, the walls were white, and the stainless steel appliances sat triumphantly in the kitchen – barely ever used. Ironically, the size of the townhome was much bigger than Patti needed – what was she going to do with three bedrooms upstairs when it’s just herself? But she couldn’t pass up the good deal – $74,900 for all 1,351 square feet. During this time the news of “bidding wars” was becoming more and more common so Patti wanted to make sure she had her offer in as soon as possible. And boy did she get lucky because the timing of her purchase was just so that other buyers barely saw the house before it was under contract! Patti enjoys her new space. She loves to be able to finally call something “home” and decorate the way she wishes. Just recently she found that she was eligible for the $8000 home buyer credit for 2009 and ammended her taxes to take advantage of the free government money. Congratulations, Patti, on your fabulous find! My name is Susan. I’m a single retiree and wanna be just like Patti! I love East Lake Village! Here’s my issue: I have just sold my home in Ocala and the closing is on or before 10-09-09. I want to buy and move into in this condo community immediately but have to wait till i sell my home to show “proof of funds”. I’ll have 60K CASH. A 2 or 3 bedroom is ideal. HELP ME SARAH!! My Cell is 720-877-1888. Thanks for looking for me, i need all the help i can get desperately as i dont want to be homeless! !